There I am just like every week! I wasn’t sure of many of you know about my weekly column. I mention it from time to time on my Friday posts but I wasn’t sure if you have seen it. 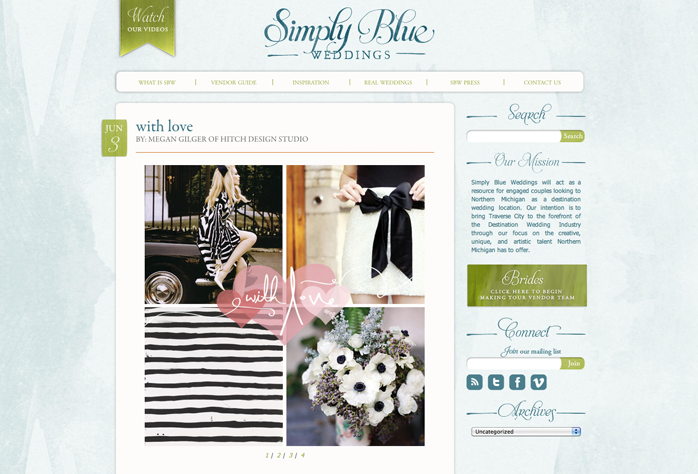 Simply Blue is a blog for Northern Michigan weddings that I was so lucky to be apart of when it launched. I was able to design the website with some of the greatest people. Without that team of people I probably wouldn’t be doing what I do everyday so this blog holds a very special place in my heart and always will. So I feel honored to be able to contribute every week. The column is basic inspiration for weddings. Not all the images are wedding photos but they are always around a certain theme to inspire a bride or heck just any awesome party. I think you all will enjoy stopping over there from time to time. So head on over to check it out! Pin love is prepping right now so hold on to them britches.